Swift, quality service delivery with the ability to change at the customer’s desire. Our IT goal requirement is rapid restoration of our production environment during an outage. Good or bad, our ability of rapid response has translated over to IT projects as well. Transforming to Agile provided an avenue to still be rapidly responsive without being stressed out. The more Agile we got, the less stressful our workload became. Now, being Agile is simply what we do. Buy-in was initially easy since our CIO asked us to look into it. We struggled with command and control middle managers who couldn’t or wouldn’t grasp the concept. We were able to complete and deliver successful smaller projects that received praise from our user departments. We were sought out by other departments to work on their projects using Agile techniques. Eventually, and perhaps reluctantly, those skeptical managers relented and saw value. We fortunately saw positive results immediately. Our County Clerk asked us to develop an interface that allows genealogists to search scanned historic school census records online. We had a phone discussion about this project that I promptly forgot we had. She called me six months later asking how the project was going. Of course, my response was, “What project?” After a thorough tongue lashing, she told me that I had two weeks to get the project online because she intended to announce the program at a genealogist conference. Our first two-week sprint was born – and we delivered. 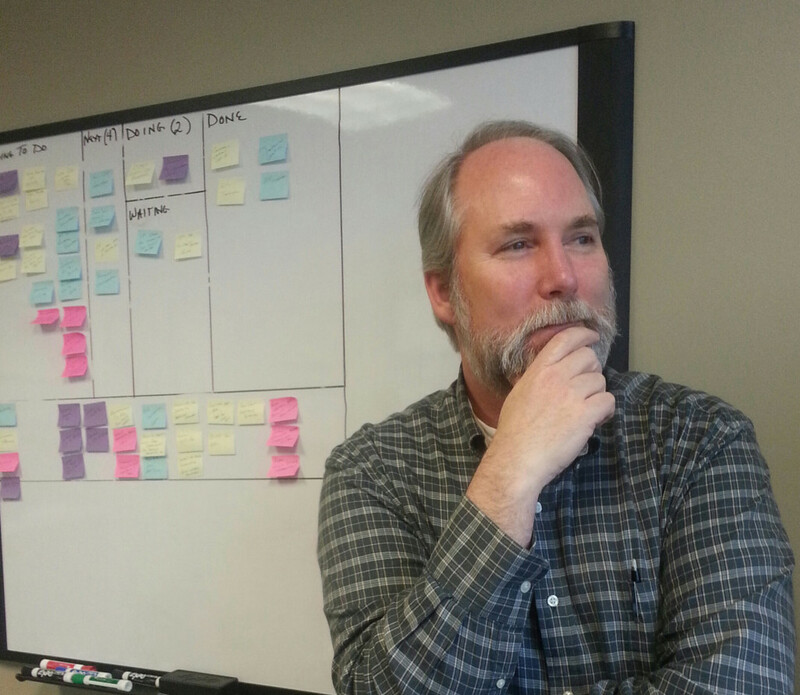 Our CIO green-lighted Agile for our Application Development team. However, we had some senior managers that looked at Agile as fad or ineffective altogether. I recall an incident with my immediate supervisor regarding our Scrum board – affectionately called the monopoly board because of its colorful task cards. She said it looked unprofessional. She asked, “What if the County Judge or a Commissioner walked by and saw all these post-its on the wall.” I responded by reminding her that all government work should be transparent. The stories and tasks on the board show exactly where we are in our progress. I could tell the Judge or a Commissioner what the team is working on that very day. She was a micromanager and could not understand how I could give the team such autonomy. We hired developers to be problems solvers. I’m simply letting them do their jobs. Our AppDev team uses Microsoft’s Team Foundation Server (TFS) to manage our Scrum stories and tasks. Our GIS team uses VersionOne – a hosted solution. Both teams print cards to post on their respective boards. Printed cards are physically moved on our board during stand-ups. The boards provide transparency and progress. Our customers want to be happy. Traditionally, we would send a project manager out to collect business requirements that included many meetings and months of time. Agile requires customer collaboration. We no longer simply respond to a customer request – we include the customer in the development of the product. Milestones and deadlines become meaningless when the customer is part of the build. We collectively decide on the workload for the Sprint and do our best to deliver. The customer knows exactly what we are working on each day. Soon, the days of delivering a project months after the requirements were gathered and agreed upon are gone. The reality is that customers change their mind. Agile expects customer changes and allows us to “course correct” during the development of the product per the customer’s wishes – leading to happiness. Start with online research. There are many examples and training videos out there for free. See if there is an Agile community (Meetup, webinars) out there near you. There may not be many ‘govies’ attending but you can learn a bunch from the private sector attendees. And finally, seek out others like you. Find other agencies that are just getting started or have been practicing Agile techniques for a while. They are out there. I recommend finding similar agencies that have already adopted Agile. They can share their training and Agile transition experience. I would stagger training with experience. Have a sprint or two to start. It’s OK – being Agile is all about improvement. You’ll get better each Sprint. Take an Agile Transition or Immersion course with your Dev team. Then go back to Sprints with improvement each time. You may not need another formal training course. Join LinkedIn Agile groups and follow Agile thought leaders on Twitter. Our AppDev and GIS teams use Scrum. Our Records office uses Kanban to manage their flow. I personally use Kanban to get stuff done (Answering these question are in my “Doing” block on my personal Kanban board). Has your adoption of Agile led to adoption with any of your colleagues in different agencies or departments? Collin County, Texas is influencing other local governments with their Agile transformations. We invite other agencies to attend our Sprint Reviews and Planning sessions. Other agencies are hopefully benefitting from our experience. I am always on the lookout for other govies that are Agile. Part-time. I believe much more enterprise cultural change is necessary for government agencies to recognize positions like Product Owner and ScrumMaster. In our case, since ScrumMasters don’t exist in adjacent agencies — then why should we have them? We may be leaders and influencers in technology, but we definitely have room to grow in changing the culture up the chain. Prioritizing work is essential to being Agile. I’ve learned that there are more to Agile projects than I thought based on the number of stories and tasks on the board. Management and customers can see daily progress being made without having to explain the details. But our most important lesson has been that we learned how to focus. We do not worry about other work on our project list. We finish what we agreed to in the current Sprint. Focus is what Sprints are all about.